Last year’s Division 1 finalists got their league campaign off to the perfect start in Pearse Stadium. Maghnus Breathnach with Ciaran Brady and Barry Fortune. FIVE PLAYERS WERE sent to the sin-bin in the second-half of this contest at Pearse Stadium as last year’s finalists Galway came from behind to get their campaign off to a winning start. 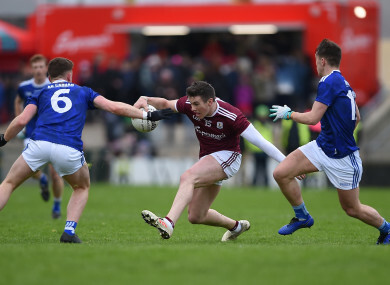 Galway had two players binned at separate stages of the second-half but Cavan were reduced to 12 men for over four minutes after three players picked up black cards. By then Galway had edged in front and Kevin Walsh’s men closed out the win against a Cavan side who only managed four points from play during the contest. Galway had wind advantage in the opening half but did not make the most of it as far too many of their attacks were laboured and Cavan were able to get numbers back and defend. An early Padraig Cunningham point was not built on by Galway and Cavan opened up a 0-3 to 0-1 lead after ten minutes as Pierce Smith and goalkeeper Raymond Galligan pointed frees either side of a superb effort from the right wing by Conor Madden. Peter Cooke, one of five late changes to the Galway starting 15, kicked a good point for Galway to make it 0-4 to 0-2 at the end of the opening quarter. Cavan hit back and Martin Reilly landed a fine free from the right and then Jack Brady made it 0-5 to 0-2. Galway hit the next three points, with Shane Walsh pointing a free from the right and Gareth Bradshaw pointing from play before Johnny Heaney had a goal effort deflected over to tie the sides at 0-5 each after 29 minutes. Cavan finished the opening half on the offensive but missed a couple of frees and the sides went in level at the break. Reilly and Cunningham exchanged points after half-time but while Galway lost Cillian McDaid to a black, they outscored Cavan by two points to one while down a man for ten minutes. Jack Brady tied the sides at 0-8 each with a superb point from a sideline on the right but then Galway opened up a two points lead for the first time when Heaney and Gary O’Donnell found the target. But then Cavan lost three players to black cards with Reilly, Killian Brady and Killian Clarke spending ten minutes in the sin bin along with Galway’s Peter Cooke, and the Tribesmen pushed on to lead by 0-12 to 0-8 thanks to efforts from Ian Burke and Heaney. Another free by Walsh put five between them but a free from Reilly and a good effort from Cian Mackey reduced the margin to a goal. That gap was reduced to two with a free from Conor Madden but Cavan were unable to rescue the tie in the dying moments as Galway held on. Scorers for Cavan: Martin Reilly 0-3 (0-2f), Pierce Smith 0-2 (0-2f), Jack Brady 0-2 (0-1sl), Conor Madden 0-2 (0-1f), Raymond Galligan 0-1 (0-1f), Cian Mackey 0-1. 11 Johnny Duane (St James’) for Burke (72). 21 Luke Fortune (Cavan Gaels) for Faulkner (66). Email “Five players sin binned during Galway's come-from-behind win over Cavan”. Feedback on “Five players sin binned during Galway's come-from-behind win over Cavan”.